With this amazing Savannah in Pajamas Bloco foam building set, you can follow the instructions to build a cheetah, zebra, giraffe, and snake, or let your creativity take over and construct wild and wonderful creatures based on your own imagination! 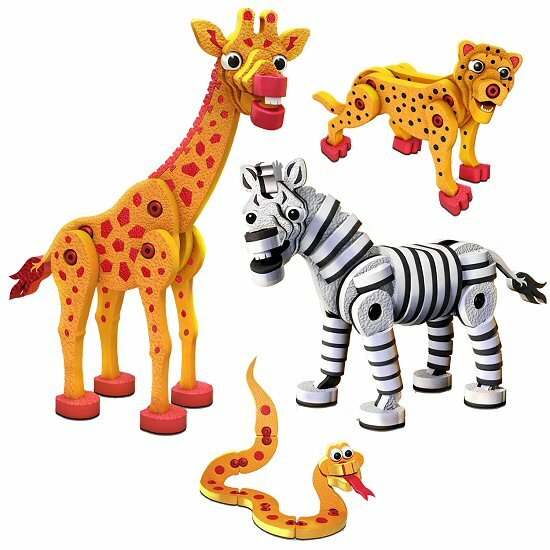 And once you've assembled your cheetah, giraffe, zebra, snake, or other savannahtastic creations, these Bloco toys go from creating to playing as they are durable enough for imaginative play and adventure. This Bloco Savannah in Pajamas foam building set is an edutaining toy that builds motor and spatial skills and with the ability to take your creations apart and start again, you'll enjoy hours of creative construction and play. Note: The cheetah, zebra, giraffe, and snake can all be built simultaneously. 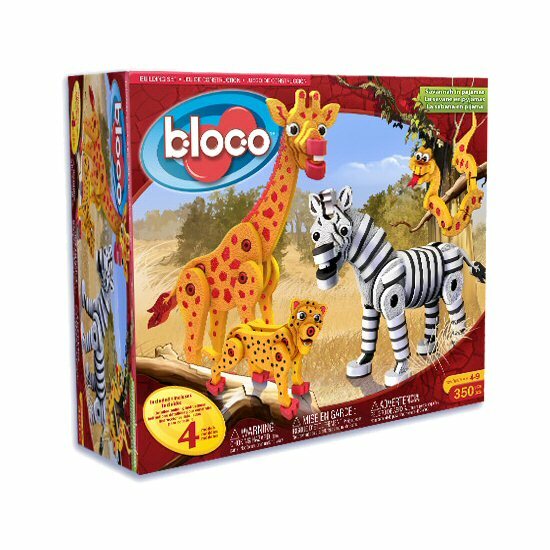 This Savannah in Pajamas construction set can be combined with other Bloco foam building sets to create even more interesting creatures. This Chimpanzee Bloco foam building set lets you build according to the instructions or get imaginative with your own fun creations. This Gorilla Bloco foam building set lets you build and create and then provides hours of imaginative play. This Mandrill Bloco foam building set lets you build according to the instructions or get imaginative with your own fun creations. This sweet Snuggle-Ups stuffed giraffe, Tanner Jr., has soft orange and cream fur, brown accents, and an understuffed body. Plush Bullet Cheetah is super cute with soft black-spotted orange fur and warm golden-brown eyes. This adorable little Handfuls stuffed zebra has soft black-stripped white fur and fluffy black mane and tail. This fun big-eyed snake plush keychain is comes in your choice of three vibrant colors... turquoise, lime green, and hot pink.